The 50/50 Ranch, owned by Evelyn and Gordon Ross, has held a small dairy for a number of years. Last month Rebecca Hunt and Chelsea Skogan-Boyd took over the dairy. Hunt said she knows it will be a lot of work with no days off and no vacations, so she asked Skogan-Boyd if she would be an equal partner. "It was a no brainer," Skogan-Boyd said. "I have always wanted to start a dairy. I worked at a dairy in Molalla for years and loved it. I know how driven and focused Rebecca is in all her adventures and said yes." The new dairy, located at 30517 South Lynn Marie Lane, is called "Two Maids A Milking Dairy". Colton's new agriculture entrepreneurs are offering milk, in half gallon or gallon sizes, cream, butter, ice cream in single size servings or gallon size, farm-house cheddar, ricotta cheese and farm fresh eggs. Skogan-Boyd said the recipes they are using come from Evelyn Ross. "Gordon and Evelyn have been teaching us everything we need to know about the business. Skogan–Boyd said, "We have a Facebook page "two Maids a Milking Dairy Queen's" to get the latest updates. 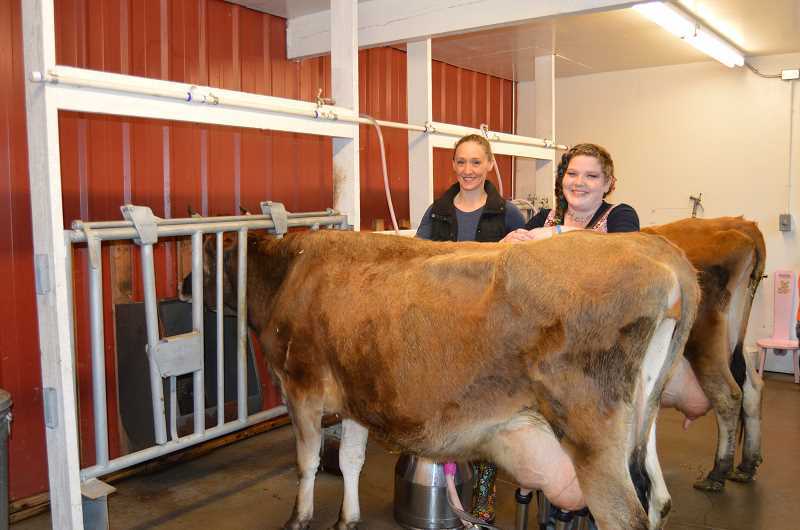 Prospective customers are asked to meet with one of the owners during regular milking times at the barn, 7:30 to 9 a.m. and 5:30 to 7 p.m. After that it is a self-serve business. You can just drive up to the ranch, choose your product, write what you are purchasing and place money in lock box. The owners say they are hoping to move to the Elwood area by this summer. They are saving funds to build a new barn and store front. About the name of the new business, "Well that came from Gordon (Ross), Skogan-Boyd said, "He just happened to call us that while we were milking." Both Hunt and Skogan-Boyd grew up in Colton and are raising their families in the community. You can check out what is in stock by visiting their Facebook page "Two Maids a Milking Dairy Queens." Colton High School has announced their students of the month for March and April. The following students received recognition for excellence in education. April: Alex McCorkle-medical opportunities and psychology, Abby Syvinski and Monique Hendrickson-chemistry, Seth Bruesch-technical math, Chayse Teach-study skills, Jenelle Baker and Karissa Haines-art I, Johnie Gonzalez-art III. Anthony Skinner-strength and conditioning, Tattum Allen-algebra II, Kathy Sculthorp and Logan Wallaert, Jacob Carpenter, Matthew Herzog and Luke McKinney-writing lab, Thomas Hoover-social skills, Colton Enz-woods I, Kenny Cassidy-metals I, Shyann Myers-English II, Karissa Haines-biology, Johnie Gonzalez-government and economics. Local telecommunications company Coltontel is researching the possibility of offering a "broadband only" (internet) service option, meaning it will not be necessary to have a landline in order to have internet. There will be several packages from which to select. Coltontel urges its members to contact them as soon as possible, "We have received 377 surveys so far but, need to hear from everyone. (They need a total of 850 responses).